With a nitrile (a rubbery but sensitive sort of feel) coated palm with a breathable seamless liner and back. Strong & hard wearing yet extremely comfortable with a great grip that retains precision of touch and feel. Washable (no need to iron!!! ), light and very very good value. Available in 5 sizes and 7 matching wrist and back colours including black (not shown). Extra Large (XL) ONLY AVAILABLE IN BLACK. Please make your selection of first choice of colour from the site and then in the special instructions box in the checkout page show your 2nd & 3rd choices since, whilst we hold a large quantity of these gloves, we can't always guarantee to have every colour in every size in stock. PLEASE NOTE THE BOX OF 3 GLOVES IS ONLY AVAILABLE AS AN ASSORTMENT OF 3 DIFFERENT COLOURS (OR ALL BLACK FOR XL OR ALL PURPLE FOR XS). PLEASE SELECT THIS CHOICE FROM THE COLOURS DROP-DOWN WHEN ORDERING A BOX. ANY REQUESTS FOR BOXES OF 3 SINGLE COLOURS WILL BE SENT OUT AS AN ASSORTMENT OF COLOURS. If they don't fit we will always either change them for another size or give a refund. Go on - give them a try! Once bought - never regretted. "Thanks for the gloves in assorted colours - they arrived safely and are the best gardening gloves I've found in terms of fit and durability. It doesn't matter too much about colour as they soon get dirty! "Please could I have 2 x lime green, 2 x aqua and 1 x blue. I'll get pink ones next time - these are the best gardening gloves I have ever had!! Just a quick message to thank you for the speedy delivery of my order. 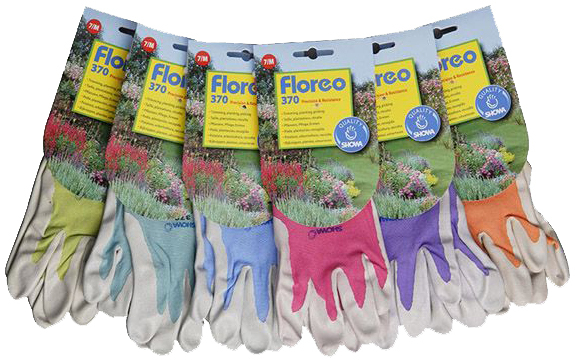 I love wearing these gloves when gardening for their robustness and comfort so was pleased to find a supplier that was offering 4 pairs at a very reasonable price. In the context of these gloves "Individual" in the drop down quantity menu below means a complete pair of gloves - ie a right and left hand.